So glad Mandie Burns pointed this one out to me! We have it shelved as an adult book, but it's an alphabet book like no other that begs to be used as a discussion starter (perhaps 3rd grade and up), whether purely to make up narratives, discuss the actual political context of the photos, or a mix of both. As the introduction says, "To look at a photo is always to recall or invent a story." With words like "unjust," "uprising," and "upperclass," there is a lot to talk about. 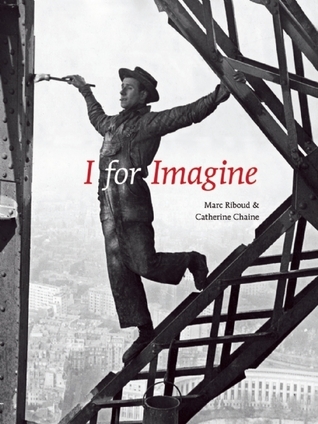 Fascinating book.Here is the Goodreads description:"The alphabet book becomes a playful dimension through which to view the powerful images of master photographer Marc Riboud. The alphabets here are pointers, at once sharpening and diffusing meaning, taking us through landscapes marked by memory and history. Delicate, whimsical, and inexorably political, these timeless images of war, love, work, revolution, and the everyday recall ways of witnessing from the golden age of photography. "From the Prologue:"So by placing the individual photograph into a narrative sequence, image, word, and meaning become part of an open ended collaboration, bringing us close to that rare thing: a deeply satisfying experience of the book form." "[Riboud] recalls that when he was young, the great Henri Cartier Bresson told him that the best way to judge the lines of a good photograph was to look at it upside down." An amazing piece of art [read: photography]! This book is a collection of photos with titles given such as, 'S for Sleep', P for Poor', etc. Each picture if paid keen attention, it sensitizes you and every picture reveals a story. I liked the book as it showed me how simplest of things and actions can be captured and portrayed as extraordinary photos! We have it shelved as an adult book, but it's an alphabet book like no other that begs to be used as a discussion starter (perhaps 3rd grade and up), whether purely to make up narratives, discuss the actual political context of the photos, or a mix of both. - Becky, Teen LibrarianReserve a library copy! A very different take on an alphabet book...gorgeous black and white photos, not sure if it would appeal to children, but I liked it! I loved I for Imagine and T for Turtle best. I would LOVE to own this book of photography. Marc Riboud Catherine Chaine - Marc Ribaud is a French photographer, best known for his extensive reports on the East: The Three Banners of China, Face of North Vietnam, Visions of China, and his most recent, In China.